Mary Anne was the first of the Emmet children born in America; she arrived four months after Jane and Thomas Addis Emmet (1) TAE reached New York. Named after TAE's sister who had died of consumption in Dublin at the the age of 31, Mary Anne grew into a handsome and accomplished woman, according to her nephew, Dr TAE (25). She was taller than her three older sisters, with a good figure and upright posture. Postponing marriage until age 27, which was considered "old" in those days, Mary Anne spent her time enjoying a busy social life. As she put it in a letter to her sister Elizabeth (4), there were lots of parties and "no end to gaiety." Her eldest brother, Robert (2) noted that the Emmet country house needed someone to manage the household as their mother, Jane, in her mid-fifties, was "out of the habit of attending" to the task. But Mary Anne, then in her late teens, was unwilling to take on the responsibility; she was having too much fun. The McEvers family were close neighbors and gave frequent parties. If some of the Emmets were left off the invitation list, they occasionally snuck inside in costume, enjoying the festivities even when their identities were discovered amidst much laughter. As the youngest daughter, Mary Anne was so strongly attached to her older sisters that when Jane (8) went off on a trip, Mary Anne burst into tears. She was a bridesmaid at Jane's wedding to Bache McEvers when she was twenty. 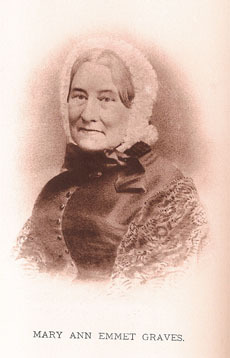 When John (5) got married in Charlottesville to Mary Tucker in 1827, Mary Anne and her younger brother Bill (11) made the weeklong journey from New York to Virginia to serve as bridesmaid and groomsman, and then accompanied the couple back to the city for a month-long visit by the newlyweds. In May of 1832, Mary Anne married Edward Attwood Boonen Graves - a "distinguished merchant and a most estimable man." One of eleven children, Edward worked in his father's firm of Boonen & Graves, and served as the Secretary of the NY Chamber of Commerce for three years. The couple had a son in December of 1833, named John after Edward Graves' father, but the baby died at their house on Broome Street before he was a year old. Their life in the city, with frequent holiday jaunts, revolved around the Emmet family and Mary Anne's large circle of friends. In the summer of 1839, the Graves went to Babylon (on the south shore of Long Island) with Margaret (3) and brother Bill (11), his wife and children, "nearly filling the place," as Mary Anne put it in one of her frequent letters to her sister Elizabeth (4) LeRoy. In the fall of 1842, the Graves's went to Ireland with Margaret (3) - the first Emmets to go there since their uncle's execution and their father's banishment by the British. They stayed in Dublin with their mother's brother, John Patten and his family, and wrote home to say he "was slow in speaking in contrast to Mama." Jane had often written to her brother urging him to come for a visit, but he never did; shortly after the group returned from Ireland, she moved into the Graves house and died there in 1846, not long after another son was born to the couple. Named after his father, this child died in Florence, MA at the age of 11 in 1854 - "a boy of good promise." Mary Anne and Edward had gone to live in the country for a while, but feeling cut off from family and friends, returned to New York soon after the child's death. Boonen & Graves took on a new partner in 1858, one R. Emmet - probably Robert (13), a nephew of Mary Anne's and son of her older brother Judge Robert (2). In 1860, Edward Graves was one of a number of businessmen, including two of Mary Anne's brothers, Judge Robert (2) and Tom (6), to host a banquet in honor of the Governor, Edwin D Morgan (see-158) to express their approval of his administration, especially "for your firm and discrete exercise of the veto power in opposition to the dangerous schemes of the late Legislature." Mary Anne was involved with a number of charities, often the same ones her sisters were working with, but she had to give them all up when her husband's health began to fail. The couple had bought a country house in Morristown, NJ, and he died of consumption there in October of 1865. While visiting Edward's niece, Sarah Meert Anthon on Staten Island in July of the following summer, Mary Anne died on July 20, 1866. She is buried with her two little boys in the Marble Cemetery in New York.